Covington has a new community coffeeshop, and it's serving much more than fresh coffee. Located on the corner of Pike and Washington streets just a block off of the Madison Avenue business district in downtown Covington, Point Perk is positioned for success. The storefront once housed The Point Restaurant and suits the coffeeshop nicely, with rows of streetside windows lined with stools for patrons. The bar is outfitted with all you'd expect from a modern coffeeshop and offers all the standard caffeinated fare, as well as non-coffee beverages and snacks. Point Perk opened in late 2015 as the newest business endeavor of local nonprofitThe Point Arc. This full-service coffeeshop is both a high-quality asset for the community and a life-giving employment opportunity for adults with intellectual and developmental disabilities. The mission of The Point Arc is to provide services to people with these disabilities — such as autism, Down syndrome and Fragile X syndrome — to help them become active community participants. Point Perk is the fourth of The Point Arc's NKY job-training business ventures. The organization also manages The Point Commercial Laundry in Dayton, The Point Embroidery and Screen Print Co. in Latonia and The Point Commercial Cleaning, all of which are self-sustaining business ventures with a staff consisting of both adults with disabilities and non-disabled managers. Through these employment programs, participants learn employable skills, good work habits, social skills and teamwork — more than 70 local employers have hired people trained in these programs. "They put in a lot of time toward helping Point Perk get set up out of their goodness of their hearts," Murphy says. "We are so thankful for them. Carabello Coffee provides our beans, and they stop by often to insure that we are serving high quality drinks." "We have two baristas trained by Carabello Coffee," she says. "They do not have disabilities. They create delicious coffee drinks and help train our employees on job and social skills with customers. "We have five employees who have intellectual and developmental disabilities, and for most of them this is their first paying job. They have a checklist that was developed by our supportive employment department at The Point Arc and are supervised and guided by the baristas. They work in customer relations, cleaning, taking orders, taking inventory and some work along side a barista or volunteer on the point of sale." "My goal," she says, "is to have a shop that serves a great product and then people see the mission behind it." "He was working in a sheltered workshop and wanted more of a challenge," she says. "During our interview with him, we were worried that Point Perk might not be the best fit. He was healing from knee surgery and was very shy and quiet. Mary, a Point employee who works at his group home, encouraged us to take a chance on him. "In the past month, his speech has improved. He's become more social and is a very hard worker. Every time I walk into the shop and ask him about his day, he nods his head and says, 'I love my job.' He is just one of our success stories of what can happen if these individuals are given an opportunity to be challenged." 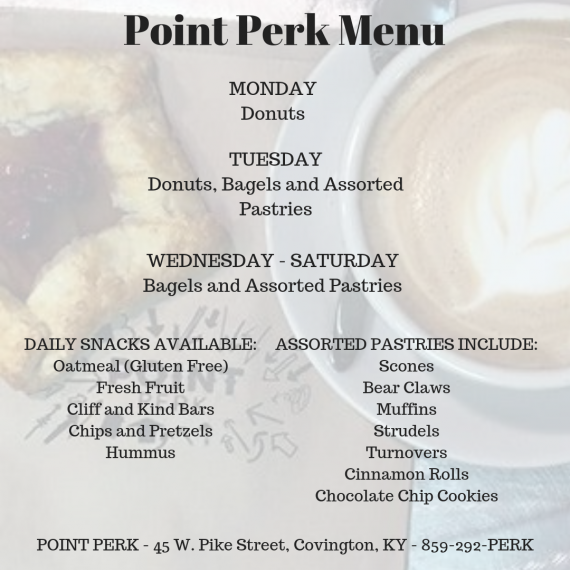 Point Perk is open 7 a.m.-3 p.m. Monday-Friday and 9 a.m.- 1 p.m. Saturday at 43 W. Pike St. in Covington. Street parking is available nearby. For an extra "perk," consider buying a "suspended coffee" for a future patron to enjoy. It's just one more reason to support this new mission-minded, high-quality coffeeshop.